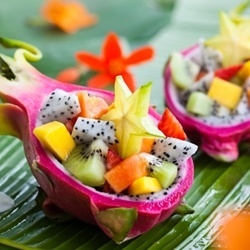 Fragrance Desrciption: An exotic fruit specialty. reminds me of sipping an umbrella drink poolside! it is based on papaya, mango and Maracujá fruit, and gives lift and radiance to floral bouquets. provides sophisticated natural freshness to citrus accords, and rounds out aldehydic and green notes.